Love creamy soups, but can’t tolerate the dairy? This simple vegetable soup is dairy-free, gluten-free and flavor-FULL. Pureed vegetable soups usually have added cream or thickeners. My creamy vegan asparagus soup gets its creamy mouth-feel from potato. Not a lot of potato – just enough to add body to the soup. Try it and see. Every cook should have two or three pureed vegetable soup recipes in their arsenal. Something quick and easy, healthy and tasty for those last minute meals or as a starter to a main course. 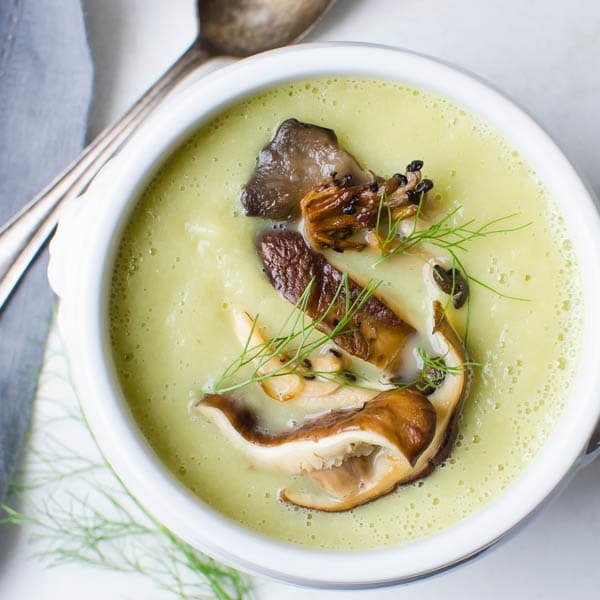 This vegan asparagus soup has fresh zucchini, spring asparagus, onions and garlic, along with a bit of potato for body and richness. You can use a peeled diced potato, but… full disclosure… I used leftover roasted potato from dinner the night before. You can too, if you have some lurking in the fridge. I had zucchini and asparagus in my crisper drawer. Asparagus is a very distinct flavor so it needed flavors that would compliment instead of competing. Zucchini has no “real” flavor, so it was the ideal vegetable. Onion and garlic lay the foundation for the soup and the potato (another neutral flavor) lended that creamy mouth-feel. Dice zucchini and onion. Mince the garlic. For raw potato, chop it into a small dice, however, if you’re using leftover roasted or boiled potatoes, you don’t have to dice them — they’re already cooked and if they’re a thin-skinned potato, you don’t have to peel them, either. Heat olive oil over medium to medium high heat in a large sauce pan and add the zucchini, onion and garlic. Sweat the vegetables until they’re tender and slightly translucent. Add the asparagus, potatoes and broth. Heat to boiling, reduce the heat to a simmer and cook for about 10 minutes or until the vegetables are very tender. Puree the soup until smooth. Add the lemon juice. Pulse again to combine. Note: The lemon is critical to this vegan asparagus soup. That touch of acid takes it from one note to hitting all the spots on your tongue. Don’t leave it out. A creamy, flavorful soup with lots of body, but gluten and dairy free! Trim the bottom one inch from the asparagus and discard (this is the tough part of the stem and it can get fibrous). Chop the asparagus into 1" pieces, reserving the tops for garnish if desired. In a large saucepan over medium high heat, add the olive oil. When hot, but not smoking add the garlic, onion and zucchini and salt. Cook and stir until the vegetables are fragrant and slightly tender, about 3-4 minutes. Add the asparagus, potatoes and broth. Bring to a boil, reduce heat to a simmer, cover and cook for about 10 minutes until the vegetables are very tender. Transfer the vegetables and broth to a blender and blend on high speed until smooth and creamy. Add the lemon juice and blend to combine. Taste for seasonings and add additional salt and/or pepper if desired. Bring a small pot of water to a boil and add a pinch of salt. Add the asparagus tips and boil for 2 minutes. Set up an ice bath in a small bowl of water. Drain the asparagus tips and transfer to the ice bath to stop the cooking process. Drain and pat dry with paper towels. Use the blanched asparagus as a garnish for the soup if desired. Ladle soup into bowls and garnish with blanched asparagus tips, a twist of lemon or a drizzle of extra virgin olive oil or other optional garnishes. Pin “Vegan Asparagus Soup” For Later! I love it that this soup is naturally vegan. It looks and sounds wonderful. What a delicious and flavorful (and healthy!) soup, perfect for any time of year. And obviously I’m obsessed with the color of it!! Soups like this are ideal for a lunch time menu, nothing too heavy and yet full of flavour. Perfect for cold winter days, and full of goodness. I love this soup, perfect for this cold weather!